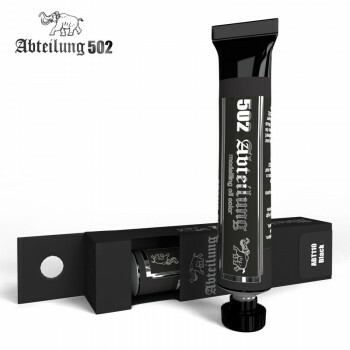 Abteilung 502 Black Oil Paint 20mlPerfect for extreme weathering effects, for panel darkening and to work on very dark surfaces. It is also used to provide depth in the hidden areas and to darken other colours adding tone variation on abandoned and destroyed vehicles. Works using pure black often result in harsh and exaggerated in combination with other colours, but this colour is ideal over dark gray tones to create the shadow areas.